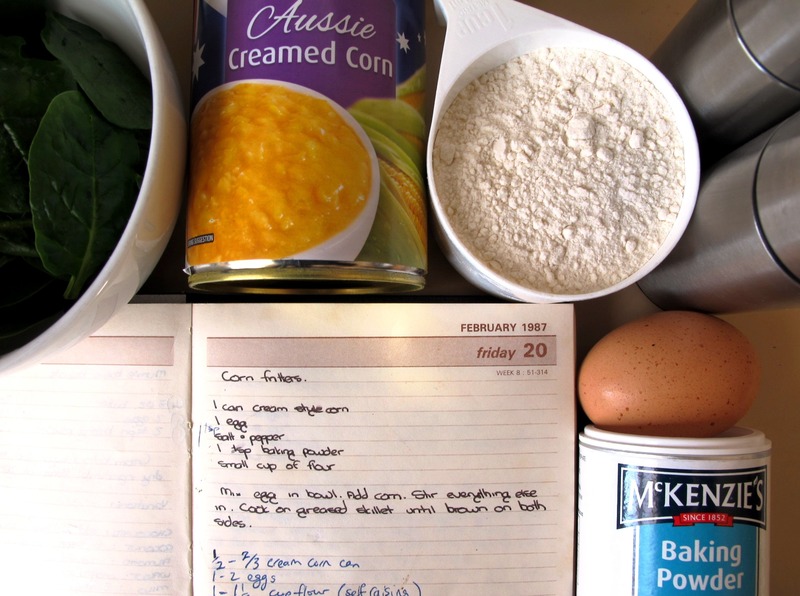 Do you have a favourite recipe from your childhood? Something that brings back nostalgic memories of mum in the kitchen? Today I share The Shopping Sherpa’s recipe for her mother’s corn fritters. The Shopping Sherpa is one of the most frugal and innovative cooks I know, determined to make her budget stretch by a $35/week food budget as part of #frugal15. I drool at her food pictures. This is a recipe from my childhood: Mum often made these for us as a weekend lunch or dinner. Quick, simple and delicious! Her recipe didn’t include the chopped spinach: that crept into my recipe after a flatmate introduced me to his family’s version, which was much more colourful (you can see the beginning of his version below Mum’s recipe in the photo). If you have children who are vegetable-phobic, you can leave it out. On the other hand, you can add more colour (and cost) by including some chopped semi-dried tomatoes into the mix. 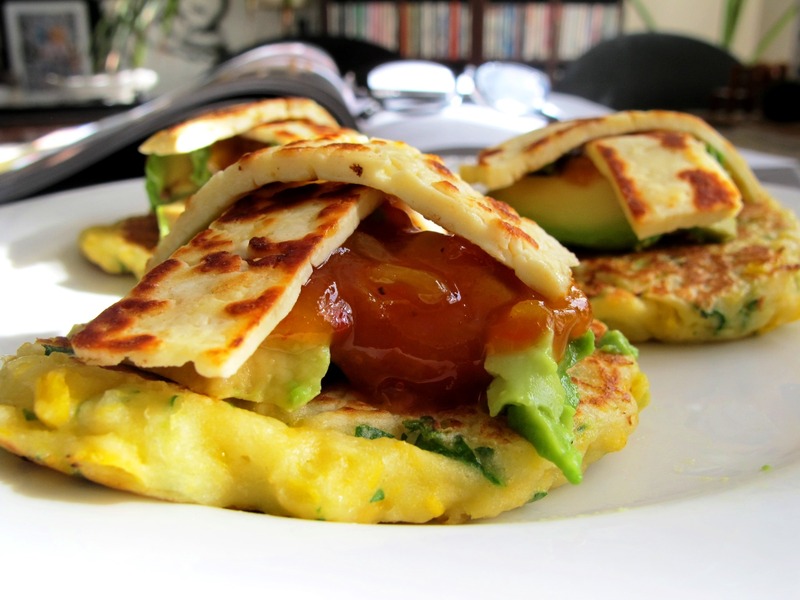 Corn fritters are incredibly versatile. When I find haloumi on special, I often serve them for brunch with avocado, fried haloumi strips and tomato relish: not quite as frugal as the plain version, but a delicious treat, and much cheaper that buying them at a café. I’ve also been known to use them as a burger patty, and pile the salad ingredients and salsa between two halves of a roll. Mix egg in a medium-sized bowl. Cook on a greased skillet or in a greased frying pan until brown on both sides. 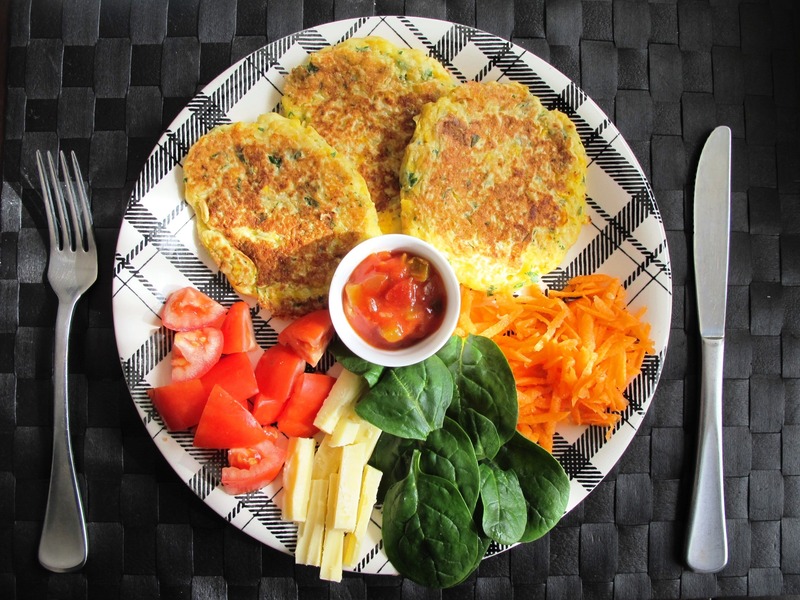 Serve with chopped tomato, cheese sticks, spinach leaves, grated carrot and a dollop of salsa. Or whatever salady-type vegetables you have on hand. Do you have a favourite, frugal recipe? If you would like to share a guest blog post, please contact me on weekendparent88[at]gmail[dot]com.